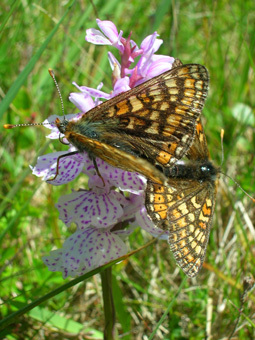 The marsh fritillary butterfly is closely linked with High Nature Value (HNV) systems. 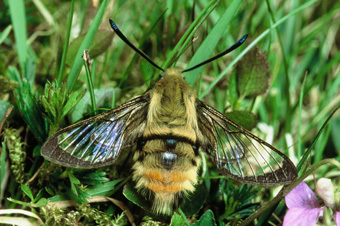 It is a species of the highest conservation concern due to severe declines right across Europe. 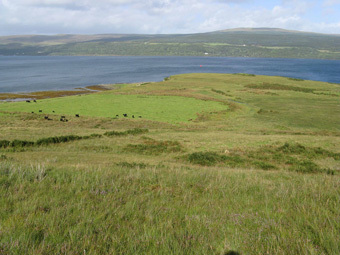 In Scotland its range is limited to the western fringes of mainland Argyll and some of the Argyll islands, nevertheless its colonies are thought to be some of the most important in Europe. The butterfly’s range in Britain has contracted westwards, and it is now virtually absent from eastern England and the Midlands, whilst in Scotland it has declined in distribution by around 12% since the mid-1980s. The overall UK decline was 46% between 1970-1982 and 1995-2004. Scottish marsh fritillary colonies occur in a wide range of different habitats including damp grassland, rush pasture, damp moorland and coastal heath. They can also occur away from grazed habitats, along roadside verges and in open woodland glades. 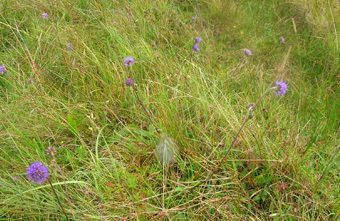 The butterfly requires abundant devil’s-bit scabious, the sole caterpillar foodplant, but in order to persist within a landscape, large areas or extensive networks of well-connected habitat patches (to form ‘metapopulations’) are required. In most situations, the maintenance of suitable habitat is best achieved through extensive grazing, ideally by cattle or ponies/horses, or sheep at low densities. The future of the marsh fritillary in Scotland, therefore, is inextricably linked to the future of HNV farming. The main mechanism for conserving the habitats of the marsh fritillary is through support from agri-environment schemes. Due to the varied nature of marsh fritillary sites in Scotland a standard grazing prescription applied to all sites is not appropriate, and management advice has to be site-specific. Many Scottish marsh fritillary colonies do not occur on designated sites, but occur in field corners or damp pockets of hill ground. Even small areas of habitat, providing they are not too isolated, are important as they contribute to the habitat network. In 2008, Butterfly Conservation employed a Specialist Advisor, with funding from Scottish Natural Heritage (SNH) and Forestry Commission Scotland. to provide advice to landowners/managers as part of a wider project to conserve the marsh fritillary and three other UK Biodiversity Action Plan species (pearl-bordered fritillary and chequered skipper butterflies, and the slender scotch burnet moth). The appointment coincided with the launch of the new agri-environment scheme, Rural Priorities, funded under the Scottish Rural Development Programme. This is a competitive scheme and contracts are awarded for the proposals that deliver regional and national priorities. Working with consultants from Scottish Agricultural College and Agrimony (an Argyll based agricultural advisory business) the Specialist Advisor drew up site-specific grazing plans in conjunction with the farmer/ landowner and their agent. Each plan took into account the habitat type, availability and type of stock and current condition of the site. Close collaboration was essential to ensure that the resulting plan was practical. By June 2011 Butterfly Conservation Scotland had been involved with around 200 marsh fritillary sites and made over 170 site visits, contributing to around 140 Rural Priorities applications. Our input and expertise was looked upon very favourably by the case officers who initially assess the applications, and by the Rural Priorities Assessment Committee that determined the applications. Over 90% of the applications we had advised on were successful and gained entry into the scheme, resulting in over 3,000 hectares being managed specifically for marsh fritillary. The project has meant that farmers can claim over £2m in grant-aid thus making farming in these economically fragile areas more viable with added benefits to the local economy. In some cases new fencing and other infrastructure was required to implement the new grazing regime, which was funded under the scheme. In addition, bracken control was undertaken over large areas. News soon spread that having marsh fritillary or suitable habitat on your farm was a good hook for getting into the scheme! Although the emphasis was on the marsh fritillary, the butterfly acts as a flagship species because the management benefits other species, including narrow-bordered bee hawk-moth, lesser butterfly orchid, reed bunting, snipe and curlew. In autumn 2011, with further funding from SNH, 88 sites that had been entered into Rural Priorities were surveyed to determine the condition of the marsh fritillary habitat, as well as the status of the butterfly. This survey will be a baseline for monitoring future habitat and population change, and the effectiveness of the prescribed management, aiding our understanding of how grazing affects the habitats and improving the future provision of management advice. The success of this project has highlighted the importance of the Specialist Advisor’s role in providing site-specific advice and liaising with the land manager, their agent and the assessors of the scheme. Written by: Tom Prescott and Paul Kirkland (Butterfly Conservation Scotland).